The Dubrovnik city walls are the major attraction for visitors and one of the best preserved fortification complexes in Europe. The 1940-metre long walls encompass five forts and sixteen towers and bastions. The worlds second most attractive museum in the open air, the walls are open for visitors all the year round. The three entrances to the walls include those next to St Lukes Church in the east, next to St Saviours Church at the Pile entrance to the Old City and next to the Maritime Museum located at St Johns Fort. Taking a walk along the Dubrovnik city walls you will see some of the striking forts used for the defence of the Dubrovnik Republic. Of the five existing forts, Minčeta, Bokar and St John were built within the city walls complex, whereas the two freestanding ones include Lovrjenac in the west and Revelin in the east. Located at the highest point of the city Fort Minčeta protected Dubrovnik from the north. The fort is the symbol of Dubrovniks defence and the flag of our homeland waves on it all the time. In summer you can also see the Libertas flag flying on Fort Minčeta. In the southwest Fort Bokar, also called Zvjezdan, stands at the corner of the city walls facing Lovrjenac. It was constructed in the 15th century for the purpose of protecting the small western City harbour, the moat and the Pile bridge. Today it houses a collection of stone fragments from the Dubrovnik area. St Johns Fort is the first quadrangular pier tower built in 1346 in order to protect the city harbour from the southeast. A long time ago the city chain was pulled by means of a winch from the fort. An aquarium is situated in the forts ground floor, whereas the first and the second floor house the Maritime Museum. At the foot of St Johns Fort is a huge pier with a lighthouse - the well-known Porporela, the meeting place of lovers, a promenade and bathing place of residents of the Old City. From Porporela one can see Fort Revelin standing outside the city walls at the eastern entrance to the city. The stone and wooden draw bridge connects the imposing fort with the land side, and another stone bridge connects it with the city. Surrounded with a moat on three sides and the sea on the fourth, the fort was a part of the city which was quite difficult to take over. Although constructed in an earlier period, Revelin acquired its present day dimensions and size in the 16th century. The interior of the fort and its terraces are concert venues of the Dubrovnik Symphony Orchestra and the Dubrovnik Summer Festival. Lovrjenac Fort is situated to the west of the Old City on a 37 metre-high rock. The symbol of Dubrovniks survival and freedom, the fort was used for the defence of the city and the western Pile gate. Above the entrance to the fort is the famed inscription: NON BENE PRO TOTO LIBERTAS VENDITUR AURO (Freedom is not sold for all gold in the world). The first official records mention the fort in 1301, although it is believed that its construction began earlier. Today Lovrjenac is well-known as one of the Dubrovnik Summer Festival open-air venues particularly suitable for works by William Shakespeare. Among the finest actors who appeared here in the role of the unfortunate prince of Denmark are Rade Šerbedžija, Daniel Day Lewis and Goran Višnjić. The residents of old Dubrovnik entered the city through two main gates, the eastern gate at Ploče and the western one at Pile. The draw bridges were pulled up at night to prevent passage to uninvited visitors. Entering the Pile gate, where one can see costumed city guards in summer, you come to the principal street called Placa or Stradun. The main open-air public space of Dubrovnik, the favourite promenade and meeting place, the venue of all great festivities and processions, Stradun is the main shopping area and the widest and most beautiful street which divides the Old City into its northern and southern part. Its origins go back to the 11th century, when the people filled up the shallow sea channel which separated the one time Islet of Lave and a settlement on it from the land where another settlement existed. Placa acquired its proper function in the late 12th century when both settlements were joined into one urban unit by a city wall complex. The name Placa comes from the Latin term "platea communis", denoting the venue of all major public events. The second name Stradun has a Venetian origin and means a large street. The Large Onofrio Fountain stands at the eastern end of Stradun. It was named after the constructor of the 11,7- kilometre long Dubrovnik water supply system from the 15th century, which supplied the stone city with water from the village of Šumet located in the Dubrovnik hinterland. A second, small fountain which Onofrio della Cava constructed was put up close to the city bell-tower. Today it still feels good to refresh oneself with cool water from the Dubrovnik fountains, while the bell-tower strikes the hours during the hot summer days. The 31-metre high City Bell-Tower with a clock was built in 1444. In 1509 the famous foundryman Ivan Rabljanin cast the bell and the green men Baro and Maro. The Dubrovnik green men on the bell-tower strike on the hour, repeating the striking after three minutes, and also strike on the half-hour. Between the City Bell-Tower and Sponza Palace is Luža, the old bell-tower, which sounded the convoking of the Dubrovnik Republic council, but also fire and other alarms. Luža was built in 1463, and thoroughly reconstructed in 1952. The monumental Sponza Palace stands on the left. Built in the Gothic-Renaissance style, it preserved its original form till the present day. At the time of the Dubrovnik Republic it housed the customs office and storehouses, and was therefore also called Divona (from the word dogana - meaning customs). Apart from the customs office, the state mint, the exchequer and treasury were also situated at the palace, designed by the Dubrovnik master Paskoje Miličević. Today the palace is the home of the major cultural institution of the Dubrovnik Archives. 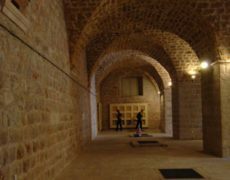 The documents which span the period from the 12th century to the fall of the Dubrovnik Republic which are kept there make this institution one of the most significant archives in the world. Particularly valuable is the collection of statutory and law books, including the Dubrovnik Statute from 1272. 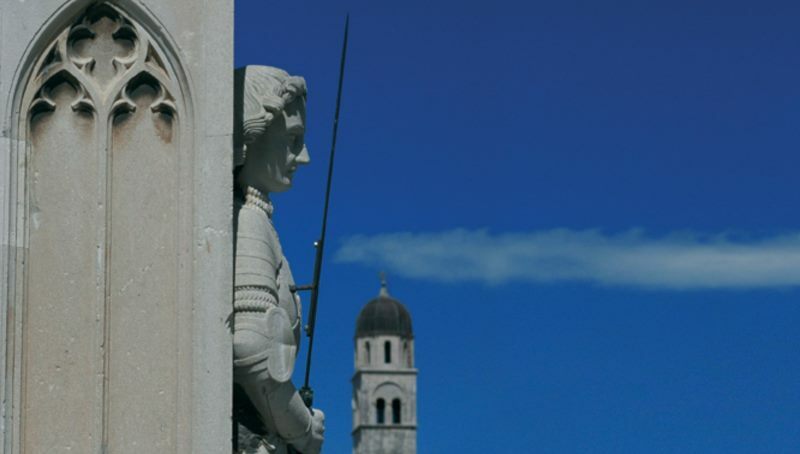 The Dubrovnik Orlando Column is adorned with a statue of the medieval knight holding a sword in his hand. With a characteristic gothic smile on his face encircled with long curls, he is considered one of Europes handsomest Rolands. According to the contract from 1418 it was made by Bonino of Milan, with the help of the Dubrovnik masters. The Orlando Column is the symbol of statehood. On its pole, where the flag of the Dubrovnik Republic once flew, the Croatian national flag now stands. 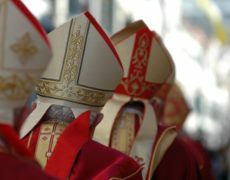 During the Festival of St Blaise, the Dubrovnik patron saint, the column is bedecked with a flag with his image, and during the Dubrovnik Summer Festival with the Libertas flag. If you stay in Dubrovnik for several days, you might like to attend mass in one of the beautiful ancient atmospheric churches where you will surely find peace in the dim light and smell of flowers and frankincense... 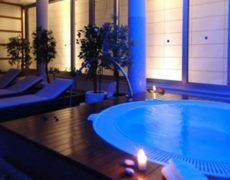 It will be in complete contrast with the glaring summer sun reflecting on the white Dubrovnik stone and the bright summer clothes of its numerous visitors. The cool interior of the churches will feel good after an exhausting walk in the hot streets. You might only light a candle made of genuine yellow wax and perhaps be lucky enough to enter St Blaises Church when somebody is playing the church organ, while the suns rays shine through the stained-glass windows illuminating the dark space of the church. The Baroque church dedicated to the Dubrovnik patron Saint Blaise was constructed according to the design of the Venetian master Marino Gropelli in 1715, on the site of the previous church in the Romanesque style dedicated to the same saint. On the main church altar is a valuable Gothic statue of St Blaise from the 15th century, the work of the Dubrovnik goldsmiths school. In addition to its artistic value, the statue has documentary worth. Thanks to the city model, which the saint holds in his left hand, the buildings that were to be destroyed later in the great earthquake can clearly be seen. The Church of St Blaise is located in the Old City centre close to the Orlando Column. The small votive Church of St Saviour is situated at the beginning of Stradun, between the Pile Gate and the Franciscan Monastery. Following a decision of the Dubrovnik Senate, the church was built in 1520 in gratitude for the saviours sparing the city from destruction in a major earthquake which befell Dubrovnik at the time. A testimony to this is a monumental tablet on the church facade. Constructed by the master Petar Andrijić of Korčula, the church remained intact during the disastrous earthquake in 1667. Preserved in its original form, it is a fine example of the Dubrovnik Renaissance building. The interior of the church is nowadays used for concerts and exhibitions. The historic records on the Old Pharmacy, founded in 1317, before the devastating earthquake in 1667 are very scarce. Initially it was a monastery pharmacy for sick Franciscan friars, in accordance with the provisions of their order. In the course of time, primarily for humanitarian and charitable reasons, the pharmacy expanded outside the monastery walls and became a public pharmacy. Today it is still in function, and its products include preparations made according to age-old recipes, which are also popular with the tourists. The pharmacy is located next to the Baroque church at the Franciscan Monastery atrium, the capitals of which are adorned with examples of the Romanesque bestiary. The church includes a picturesque hall in the Renaissance style, music archives, a rich library and silver and gold art objects. The Dubrovnik Cathedral of the Assumption of the Virgin Mary exists in its present day form from the early 18th century. According to historic records, the former Romanesque cathedral was an outstandingly luxurious church with a cupola, richly decorated with statues. Legend has it that it was built with the votive money which the English king Richard the Lionheart donated having survived a shipwreck near the Island of Lokrum in 1192 on his way back from the 3rd Crusade. During the restoration works on the Cathedral in 1981, the remains of another earlier cathedral were found, the architectural features of which determine its origins between the 6th and 8th century. This discovery gave a new dimension to the early history of Dubrovnik, bearing evidence of the city being a developed urban community as early as in the 7th century. The Cathedral now houses a rich treasury including paintings and relics, and in its apse stands Titians poliptych the Assumption of the Virgin Mary from 1552. St Dominics Church is one of the largest buildings in the Gothic style on the Croatian coast. Constructed according to a simple architectural design, it has one nave with a Gothic apse, separated from the remaining area of the church with three high openings with the Gothic vaults. In the central vault above the main altar is a huge highly valued Crucifix by Paolo Veneziano from 1314. The Dominican Monastery paintings include works by the 15th and 16th century masters of the Dubrovnik school of painting (Božidarević, Hamzić and Dobričević) and a canvas by the great Titian with the Dubrovnik patron St Blaise, St Mary Magdalene and the angel Raphael. Valuable Dominican documents, incunabula, manuscripts, the Bible from the 11th century and a jewellery collection of the Dubrovnik goldsmiths are also exhibited at the church. 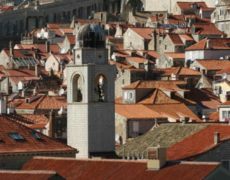 A walk in the city streets and Stradun will certainly take you to some of the numerous Dubrovnik squares. Situated in front of the Cathedral, the Marin Držić Square leads to the city district of Karmen, to the city harbour and to the Aquarium. The people of Dubrovnik once called it "in front of Our Ladys Church". The buildings in the square include the Dubrovnik Cathedral, the Sorkočevič Palace, the little Church of St Bartholomew, the Dulčić-Masle-Pulitika Gallery and the Memorial Room of the American Minister of Economics Ronald Brown who died on 3 April 1996 when his American plane crashed on St Johns Hill. The square was named after Marin Držić - Vidra (Dubrovnik 1508 - Venice 1567), the playwright, poet, conspirator and church organist. He studied in Dubrovnik and in Italy. In 1541 Držić was appointed Vice-Chancellor of Siena University. While staying in Florence in 1566 he asked the help of Cosimo Medici in overthrowing the Dubrovnik Republic regime and in introducing a system in which persons who were not of noble birth could also govern. In his works he wrote about the universal human themes: love, longing for youth and miserliness. Držićs plays vibrate with the vitality of life. His best-known works include Tirena, Grižula, Venus and Adonis, The Story of Stanac, The Miser, Hecuba and Uncle Maroje. In his comedy Uncle Maroje Držić conjured up a vision of a society of equals with no difference between good and bad people, portraying the main feature of his time - miserliness. A statue of the Dubrovnik poet Ivan Gundulić (Dubrovnik 1589 - 1638) stands in the Gundulić Square. Educated in his native city, Gundulić was appointed Rector of Konavle twice, a senator, Minor Council member and envoy to a Bosnian pasha. The major representative of the Baroque style in Dubrovnik, he wrote works which reveal the spirit of the Catholic reformation. His main motifs include realisations about the transitoriness of human life. Among Gundulićs best-known works are Tears of the Prodigal Son (Venice, 1622), Dubravka (performed in Dubrovnik in 1628) and Osman (printed as late as 1826). He was buried in the Franciscan Church, and the oldest copies of Osman from 1652 and a copy from 1826 printed in Dubrovnik are kept in the Franciscan Monastery library. Apart from the statue of Gundulić from the 19th century, a small Amerling Fountain - damaged during the aggression in 1991 - stands in the square of the same name, which was constructed after the disastrous earthquake in 1667. The square is the venue of the green market, where dwellers of the nearby villages sell their products. The monumental Baroque stairs in the southern part of the Gundulić Square lead to the Ruđer Bošković Square. The buildings in the square include the Jesuit Church of St Ignatius and the Collegium Ragusinum, the famous Dubrovnik Jesuit school. 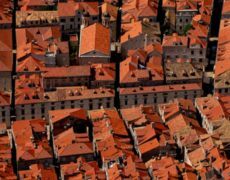 Many people consider this urban complex to be the finest Baroque set of buildings in all of Dalmatia. St Ignatius Church was completed in 1725 after the design of the famous Jesuit architect Ignazio Pozzo. It houses trompe loeil Baroque frescos by the painter Gaetano Garcia portraying scenes from the life of St Ignatius, the founder of the Jesuit order. Adjoining the church facade at an angle of 45 degrees stands the building of the Jesuit Collegium. Its neutral and hard lines accentuate the Baroque facade of the church and the Baroque steps that descend into the city. The designer of the magnificent Baroque steps is the Roman architect Pietro Passalacqua. Designed in 1738, the impressive steps are reminiscent of the famous steps leading to the Trinit? dei Monti Church in the Piazza di Spagna in Rome. The first records of the Island of Lokrum from 1023 mention it as the venue of the foundation of a Benedictine Abbey and Monastery. Legend has it that after a shipwreck on his way back from the Crusade in Palestine, Richard the Lionheart found shelter precisely on the Island of Lokrum in 1192. As a sign of gratitude should he be saved, he made a vow to build a church in the place where he would come ashore. However, he fulfilled his vow only in part. 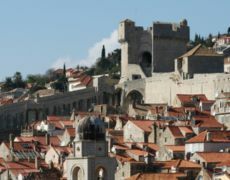 Upon the request of the people of Dubrovnik, Richard the Lionheart provided the money for the continuation of the building of the cathedral within the city. In 1839 Maximilian von Habsburg visited and bought the Island of Lokrum. He had his summer residence built on the ruins of the monastery with a magnificent garden, walking paths and promenades. The tradition of gardening and cultivation of exotic plants from the time of the Benedictines via Maximilian von Habsburg until today was continued in 1959, when the Botanical Garden was founded. The majority of plants were brought from Australia and South America, and the collection of eucalyptuses, cactuses and succulent plants is a special attraction. In 1963 the Island of Lokrum was declared a Natural Reserve and in 1976 a Special Forestry Reserve. A small lake on the island called Mrtvo More (Dead Sea), connected with the open sea, is suitable for children and non-swimmers. Located on an elevation, the star-shaped Fort Royal, built by the French in 1806, offers a magnificent view of Dubrovnik, Cavtat and the islands. In only ten minutes, a boat from the Old City Harbour will take you to the nearby Island of Lokrum, a favourite excursion place also known as the Island of Love. In the course of history the Elafite Islands relied on the city of Dubrovnik and the Dubrovnik Republic, in whose possession they had supposedly been from the 11th century. According to historic records, the rector of the Islands of Koločep, Lopud and Šipan was appointed in 1272. The islands were inhabited from ancient times, a fact which is borne out by the remains of Illyrian buildings and Greek and Roman toponyms. 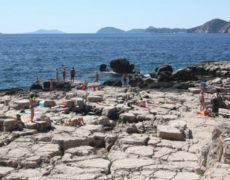 The commitment to the sea and seamanship improved life conditions on the Elafite Islands, which flourished during the golden age of Dubrovnik in the 15th and 16th centuries. 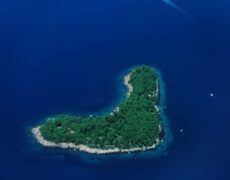 Of the thirteen Elafite Islands only three are inhabited: Koločep, Lopud and Šipan. During your stay in Dubrovnik, do not miss visiting them on the old steam-boat Postira. You can visit all three islands in one day and enjoy exploring the little old-Croatian churches on the Island of Koločep, bathe on the sandy beach of Šunj on the Island of Lopud, visit the summer residence of the Skočibuha-Stjepović family in Suđurađ and walk the fertile Šipan field covered with olive groves and vineyards, passing by the Rectors Palace, up to the Church of St Stephen in the Luka Šipanska. 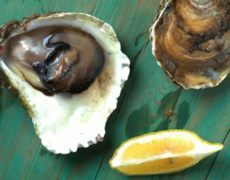 The islands boast their own gastronomic delicacies. The fishermen bring the freshly caught fish from the crystal blue sea, and the taste of ecologically-grown vegetables is enhanced by home-made olive oil. Visit the Art Pavilion Your Black Horizon on the Island of Lopud, which has included the island in a tourist-art map of the world. An obligatory destination for lovers of modern art and summer vacation, this project was realised thanks to the International Thyssen-Bornemisza Contemporary Art (T-B A21) Foundation presided over by the distinguished modern art collector Francesca von Habsburg. The Art Pavilion Your Black Horizon, which is the joint work of the Danish-Icelandic artist Olafur Eliasson and the London architect David Adjaye, unites art and architecture, and is special primarily for its adaptability to a certain location and its environment. The 413-metre high Mount Srđ rises northwards from Dubrovnik. The monumental Fort Imperial was built in this strategic place during Napoleons occupation in 1810. From the fort the French controlled Dubrovniks sea and hinterlands. Fort Imperial, as the first line of defence, played a major role during the Croatian War of Independence. A huge stone cross stands near the fort. The former cross made of well-known Brač stone -a present from the Brač-Hvar Archbishops District to Dubrovnik in 1933 - was destroyed during the Croatian War of Independence, and the new one - also a present from the Brač-Hvar Archbishops District - was erected after the war. A favourite place for taking photographs, Mount Srđ offers a magnificent view of Dubrovnik and its surroundings. Fort Imperial houses a museum display of the Croatian War of Independence with numerous exhibits including all kinds of weapons and shells which hit Dubrovnik during the bombardment, documents and video presentations of the war and suffering in Dubrovnik. In bygone times Dubrovnik was a crossroads of caravan routes. In great danger of contracting the plague, the people of Dubrovnik built lazarettos which served as isolation hospitals. Visitors from pestiferous and suspicious areas - according to a Liber Viridis regulation from 1377 entitled "Visitors from pestiferous areas are forbidden to enter Dubrovnik and its surroundings" - had to spend 40 days in special places in Cavtat, on the Islands of Mrkan, Bobara and St Peter. This initiated the construction of the first lazarettos in the Dubrovnik Republic. All merchants - particularly those arriving from areas contaminated by plague - as well as seamen, and all suspicious and pestiferous people had to stay in quarantine before entering the city. The history of the Dubrovnik lazarettos reflects the entire history of the protection against plague in the Dubrovnik Republic. The last constructed lazaretto is the one located at the eastern entrance to the city called Ploče. The construction of the lazaretto, comprising 5 buildings, was completed in 1642. One entered these buildings by stairs, and the corridors in front of the structures were connected by a spacious area. The lazaretto had its own water cistern, and the city authorities provided it with a priest, physician, barber-surgeon and sufficient number of attendants. The lazaretto regulations were very strict and were maintained rigorously. The lazaretto has been excellently preserved and some of its buildings are nowadays venues for various art and craft workshops. It also houses a stage for performances by the Linđo Folklore Ensemble and those by various young artists associations. Paskoje Miličević (born around 1440) became a municipal engineer as early as 1466. He became widely famous for building the bastion of St Luke at the harbour entrance (1484) and for his other construction works in the Dubrovnik harbour. Milićević began the plan for the harbour according to one of two proposals which he had sent to the Major Council. After the construction of the Kaše breakwater, the harbour area was protected both from huge waves and enemies. Before that, the harbour was protected by a chain stretching from St Johns to St Lukes Fort. Milićević also worked on the new Od Ponte Gate, constructed after a design by Juraj Dalmatinac. He completed his works on the harbour in the early 16th century. The Peskarija (fish market) and the Porporela lungomare-breakwater were built in the 19th century during Austrian rule. The large and small arsenals, where ships were built and repaired - the present-day Arsenal Restaurant - were also situated in the city harbour.